It has been a pleasure to host Birrang Enterprises at our office over the past couple of weeks. They have been running a Free L’s and P’s course which is a fantastic service. Their educator, Lyndal knows her stuff and I hear heaps of positive feedback coming from the room next door. Three of our Skillset Green Army team members have and will be benefiting from the program, with two of them obtaining their L’s last week and working towards their P’s, which was fantastic! We know that having their P’s will increase employment possibilities for them as they seek work when they complete the programme. We look forward to more progress over the next few weeks as people continue to work through the program. It is a pleasure for us to host Birrang to offer this service to the community. If you would like to know more about this program, contact Birrang on 0419 132 347. 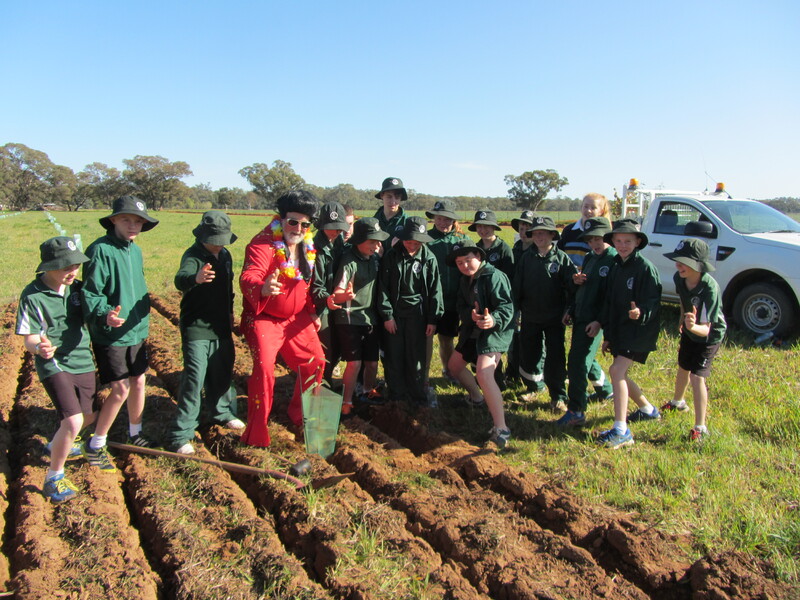 In conjunction with the Central West Local Land Services and Meat and Livestock Australia, Cooks Myalls Landcare Group are holding a field day at Cooks Myalls. Guest speakers include, Dr Belinda Hackney, Senior Land Services Officer with Central West Local Land Services and Landmark Agronomist, Angus Hodgkinson. The Field Day will be looking at the results of a pasture trail that was undertaken to assess how effective the addition of temperate legumes to increasing sub-tropical pasture growth, total biomass and feed quality compared to using nitrogen fertilisers. Some of the ten species included in the trail were Prima Gland, Casbah Biserrula and Losa. The focus of the day will be on variety selection, establishment, results so far and nitrogen fixation. The venue and speakers are booked for our Compost on the Farm Workshop in the Parkes area. 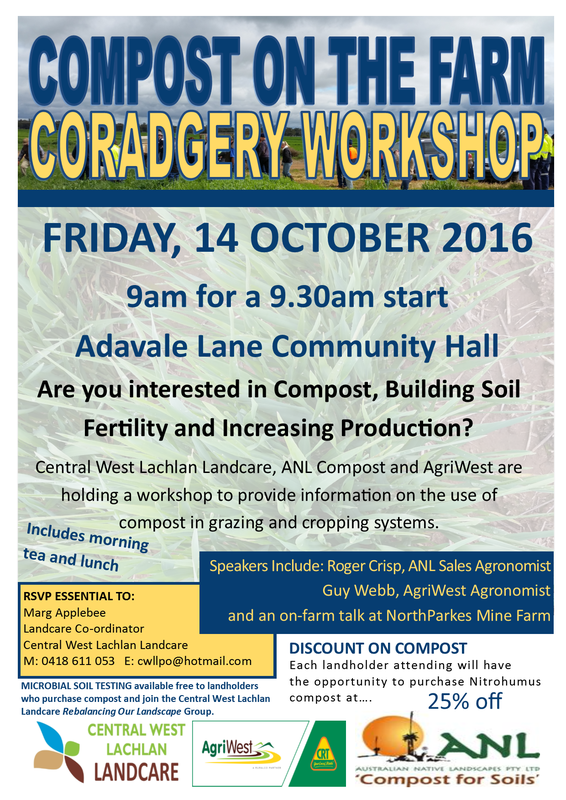 After the success of the Bedgerabong Compost on the Farm Workshop last month, we are pleased to be able to provide a workshop at the Adavale Lane Community Hall. Click here for more info. This workshop is provided free to the community with the support of ANL (Australian Native Landscapes) and Agriwest and will be looking at trials undertaken by the NorthParkes Mine using ANL Compost. Roger Crisp, Sales Agronomist with ANL will give an overview of the compost products and will provide some of the nitty gritty information about how the compost is processed, nutrients and organic matter making a high quality product for broadacre pastures or cropping. ANL have developed a purpose built facility near Blayney where they are producing compost as an alternative to using synthetic nutrients. We are hoping that attendees will also be involved in our Re-balancing Our Landscape Program that we are delivering, which runs over two years. Through this program we hope to be able to provide workshops, information and opportunities to the group to assist with on-farm decision making, for free or heavily discounted. It was lovely to be part of the Forbes Show last week, regardless of the weather. It was good to catch up with a few familiar faces and meet people who were interested in improving their plot, be it backyard or large scale landholding. 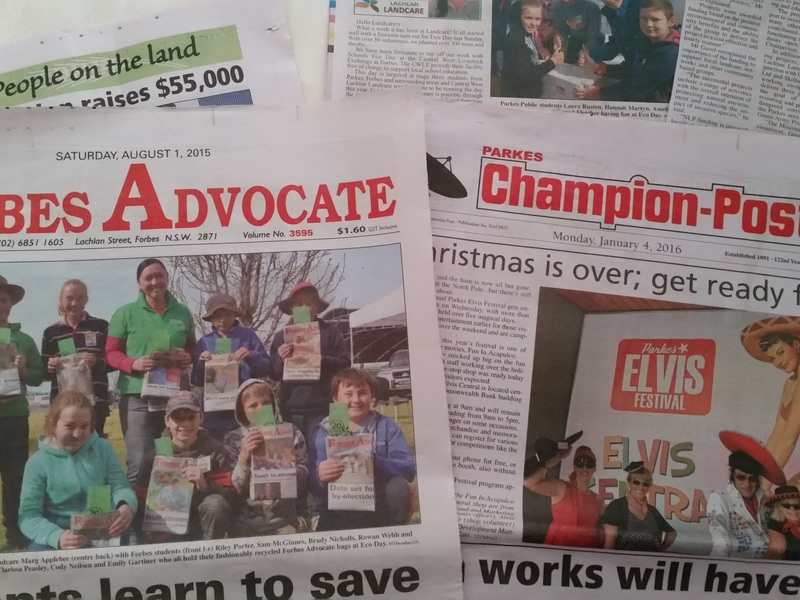 It was nice to be able to contribute towards Forbes Shire Council’s win with their Best Commercial Display – Outside.